Opposition leader Raila Odinga has urged Kenyans not to panic over the hiked fuel prices saying it will soon be reversed. Raila said he has faith that President Uhuru Kenyatta will shelve the increment once he assents to the bill as passed by Parliament. He said MPs recently made an amendment to the Finance Bill to block the increment which he expressed confidence that Uhuru will soon sign. “You should not panic at all. Very soon the President will scrap off the heavy levy on fuel products. 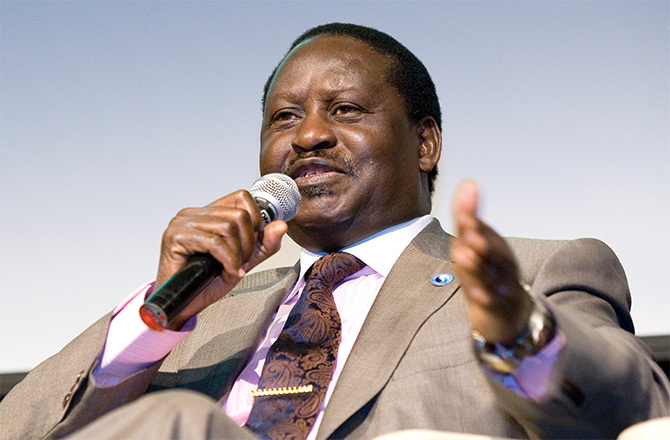 He listens to public outcry,” Raila said. He was speaking during the National Government Affirmative Action Funds Football tournament at Kenyatta Sports grounds in Kisumu on Sunday. On corruption, he said ODM and NASA are fully behind President Uhuru Kenyatta. He said those involved in corruption will not be spared irrespective of their status in society in the ongoing crackdown. Raila reiterated government’s position that the fight on corruption was not targeting individuals or communities. “Corruption is not targeting a particular community or leader but only those who have acquired public funds illegally,” he said. The former Prime Minister asked the Asset Recovery Authority to move with speed and recover stolen public assets and monies. He noted that if corruption is not extensively fought the country stands to lose Sh700 Billion. Leaders who attended the event opposed the operationalisation of VAT on fuel products. Senators James Orengo (Siaya), Fred Outa (Kisumu), MPs Shakeel Shabbir (Kisumu East), Fred Ouda (Kisumu Central) and EALA MP Oburu Oginga were present. Women Representatives Rosa Buyu (Kisumu), Gladys Wanga (Homa Bay), Pamela Odhiambo (Migori) among others also attended. The energy regulator revised fuel prices on Saturday. Orengo accused Treasury CS Henry Rotich of imposing heavy taxes on Kenyans and demanded for suspension of the levy. “No taxation without people’s representatives. When Parliament said no to taxes on fuel products then you should respect that,” he said. Too much acting, he should have signed it b4 flying out: afterall the damage has been done and even if he signs the bill, it will not give him any credit cos he never cared about the will of the people as the bill was and is in his desk. The incompetence of the kenyan embassy in germany started way back when they were still in bonn. its quite useless.this is nothing new. Most Embassies in Europ are very corrupt .Ambassadors abroad must be investigated for corruption and the way they treat kenya embassy staff worse than slavery. This is NOT acceptble at all …. We must comb Boni forest ruthlessly and nutralize those concerned…. Ground Intelligence should be able to help in this operation.Help Alshaababs always because they are taming and destroying KDF impunity in Kenya Alshaabab is not Mts Elgon idiots .More EDF devices and more youth join Boni liberators. The pinch is in feeling it will provoke countrywide protests, we must brace our selves for hard times as taxes are now seemingly drowning the citizenry they ought to help. Wastage is rife and robbery with violence has been normalized. Famers and town folks alike must come out and protest against high taxation and plunder/sleez . Call it the rich bullying the poor…quite unacceptable, using sham elections to validate looting. People power is the answer, protests are a must. The poor must resist this tax anarchy, bring down the taxes or face the boot, The farmer man is angry. Kenya a cursed Country where 99 % of the population loves and admires slavery.With Chinese Money and china overcoming both USA and Europe Africa is doomed .